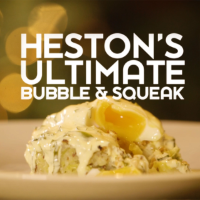 In this recipe Heston makes the vegetable mixture from scratch, but you can use a mixture of any leftover vegetables if you prefer. 1. Place the potatoes in a pan with salted water. Simmer for about 15-20 minutes, until the potatoes are beginning to fall apart. Pass through a strainer. Place in a bowl and crush with a fork, leaving some chunky bits. 2. Place the butter in a medium size pan over medium heat and add the shallot and garlic. Continue to cook until the shallots and the garlic are cooked through but not coloured. Add the shredded cabbage, stir well to coat in the butter and cook gently until tender. Blanch the leeks in hot water for 30 seconds. 3. Mix together the vegetables with the potato, mustard and seasoning. 1. Place the double cream, mustard and lemon juice in a pan over medium heat and bring to a simmer. 2. Remove the sauce from the heat and add the parsley. 1. Combine the panko crumbs and Parmigiano Reggiano in a bowl. 2. Place the bubble and squeak mixture in a pan and warm through. Divide between 8 x 7cm greased cylindrical moulds or presentation rings, press in and cover the tops with the breadcrumb mix. 3. To poach the eggs, fill a large saucepan with approximately 15-20cm of water then add the salt. Place a plate upside down in the bottom of the pan then place the pan over a medium heat and bring the water up to 80ºC. Check the temperature using a thermometer or probe. 4. One at a time, crack each egg into a ramekin dish and pour it into a slotted spoon with small holes. Let any watery white drain for approximately 1 minute. 5. Lower the slotted spoon into the warm water and slide the spoon out. Allow to poach for 4 minutes. 6. Remove with the slotted spoon and pat with kitchen paper to remove any excess water. 7. Place the bubble and squeak under a preheated grill to colour the top slightly, then place in a hot pan to colour the bottom. Carefully remove from the moulds, place the poached eggs on top and serve with the sauce on the side.